Now that checksum can deal with Long Paths, I thought it was about time that I put together a tool that can enable folk to access these hard-to-reach files and folders. In truth, I rarely have to deal with long paths, that is, paths beyond the Windows limit of 259 actual characters (i.e. 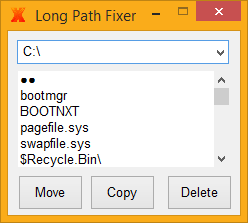 MAX_PATH) myself, but I know many do, judging by the feature requests I got for checksum. Whenever I have had to deal with long paths, it's usually just to delete the offending file or folder, perhaps move or copy it to somewhere with a path that Explorer can get to. And on those occasions, I have been frustrated by the fact that the only easy-to-use tools available for this occasional task are far from free. I mean, twenty bucks to delete a file? I think not! It's a simple tool which lets you "get at" files and folders with Very Long Paths (up to 32,767 characters in length) and do stuff, like move, copy and delete, and so on. There is a page all about it (click the image, above) so I won't waste more time typing here. Have fun!